That's what our former mayor, Rick Baker, would say every day in St Petersburg. You know what? He was right ... every time. 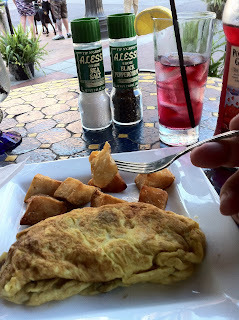 Today, for example, I wandered downtown, stopped at a corner eatery called Ceviche and had a fantastic ham, cheese, pepper, mushroom omelette. That's it on the left ... with my fat mitt spearing a delicious potato. Yes ... I was in heaven. The weather was true Chamber of Commerce perfection: blue sky, clear day and 70 degrees. The downtown waterfront was bustling and music drifted over my table. It was Jimmy Buffet stuff ... perfect for dining in Florida. 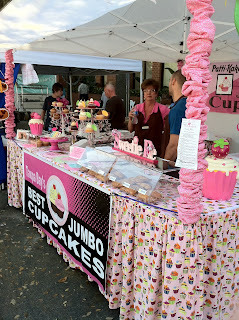 Across the street, the Saturday Morning Market was just kicking into full swing. 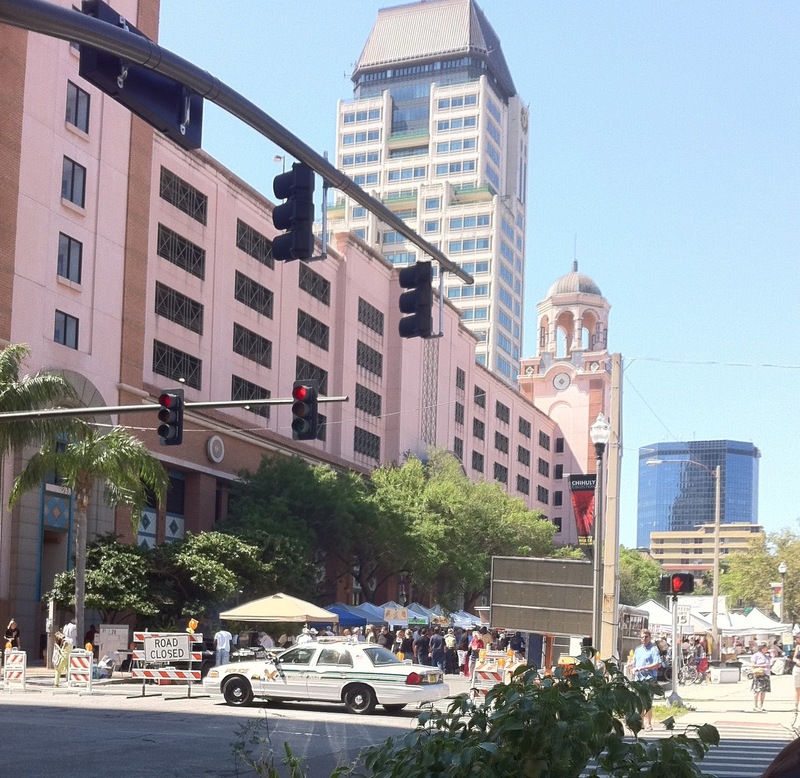 Vendors were all showing their wears, down Central Avenue. At the corner ... a latecomer to St. Patrick's Day waited to cross the street. 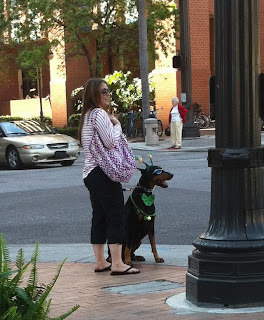 It was a doberman in shades and green antlers. You'd think he'd be embarrassed ... but no ... he just smiled at the crowd. 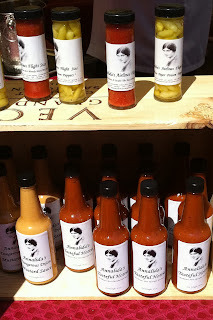 I decided to check out the market myself. The first stop is always "Mr. I Got 'Em". 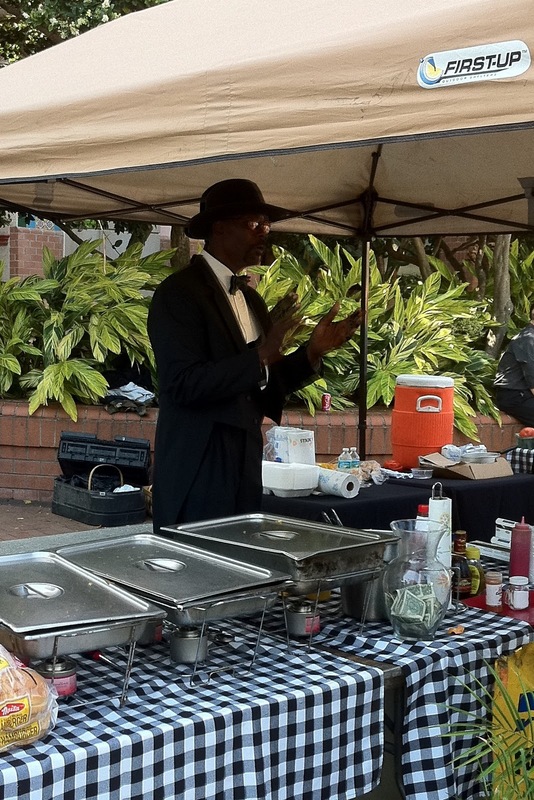 Dressed to the nines in his tux, tie and hat ... "Mr." works the crowd selling his down home cooking and fruits and veggies. 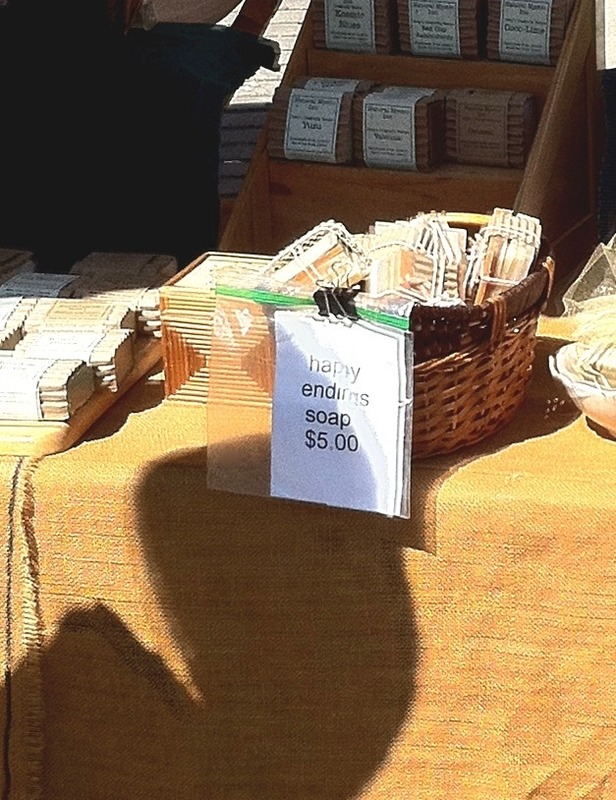 Before you eat ... might want to buy a bar of happy ending soap. Only $5 and guaranteed. I passed on that one. 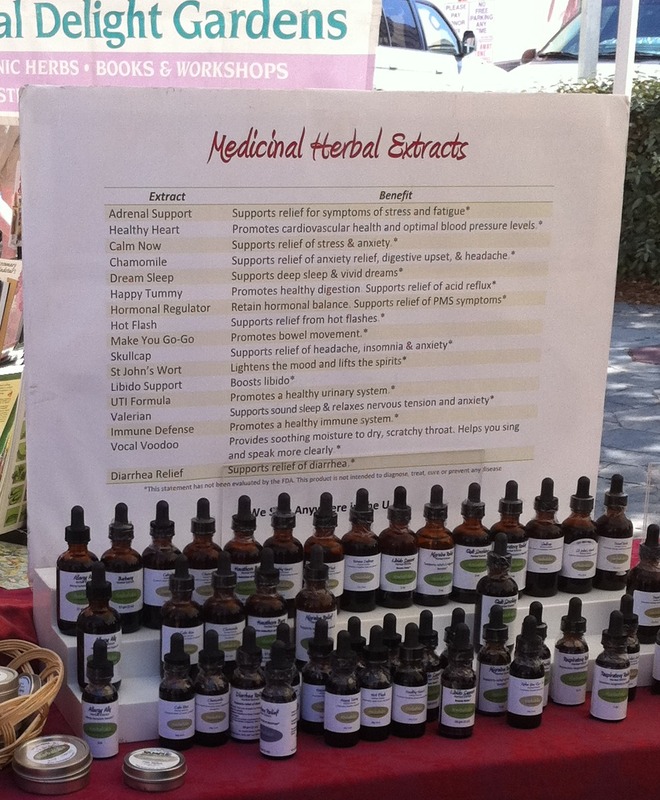 For those into the natural health products ... 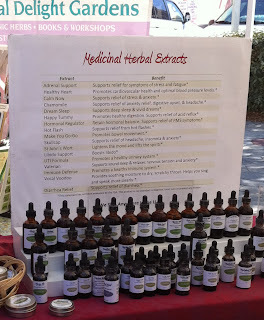 I noticed a booth that held the secret to life: Medicinal Herb Extracts. 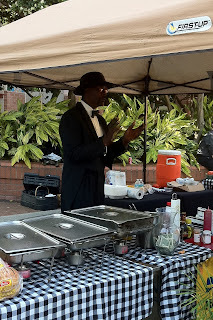 Make You Go-Go to start you up, Diarrhea Relief to stop you up and the ever popular Vocal Voodoo so you can start speaking more clearly. 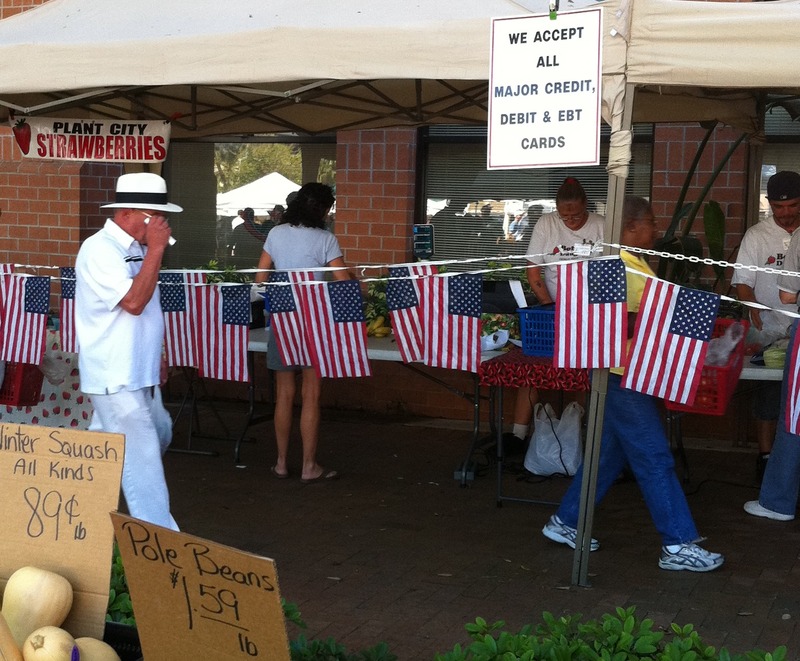 Plant City Strawberries had their own special spot. If you live here you know they are the best (and apparently the most patriotic) strawberries around. Check out the BEST JUMBO CUPCAKES IN TAMPA BAY. I could have eaten the whole booth. 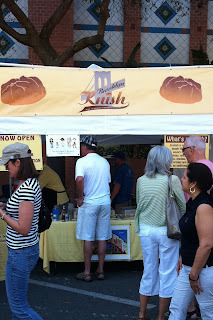 There was even a Brooklyn Knish that got into the mix. What am I saying? For the masses that want to leave the snow and crummy weather to come here ... forget it ... I lied! 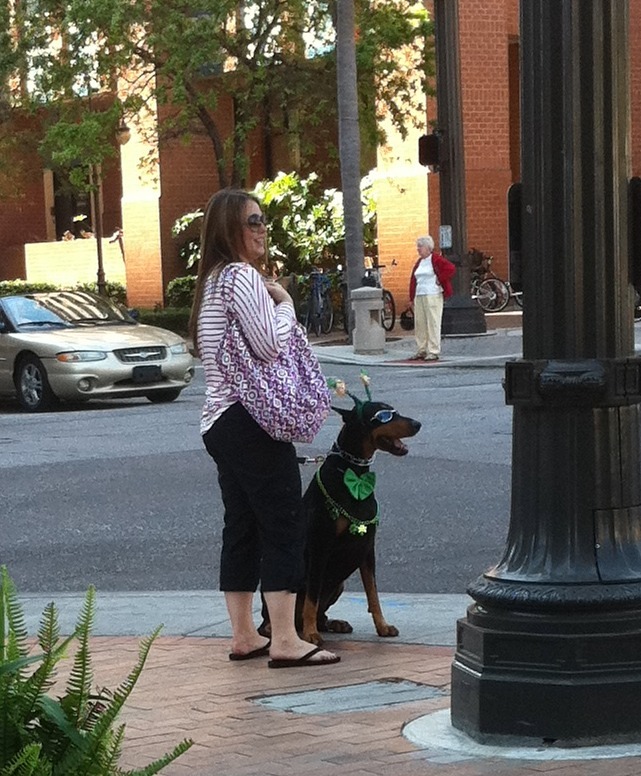 This is really St. Pete. Trust me ... you don't want to move here. Oh my gosh, Joel, that looks awesome! That's for making me hate Cleveland.